Congrats to Linda, who won a copy of THE DOG YEAR by guest author Ann Garvin! Heather Webb has forgotten what it’s like to speak in coherent sentences (or do anything else for that matter). Revisions have consumed her brain and HER LIFE. But, but, but RODIN’S LOVER will be submitted tomorrow and life will resume as normal! Lisa Alber received a surprise blurb from one of her favorite authors ever, New York Times bestseller, Julia Spencer-Fleming! Woohoo! Brooding, gothic overtones haunt Lisa Alber’s polished, atmospheric debut. Romance, mysticism, and the verdant Irish countryside all contribute to making KILMOON a marvelous, suspenseful read. 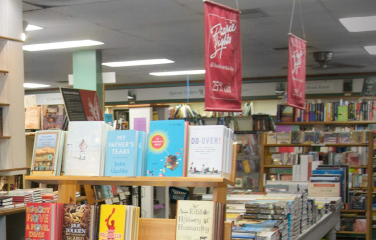 Susan Gloss did her first official author reading and book signing this week at Prairie Lights bookstore for the Midwest Independent Booksellers Association conference. Lori Rader-Day had a blast meeting lots of librarians at PLA in Indianapolis last week and will be at her very first Left Coast Crime in Monterey, California, this week. There had better not be any snow. P.S. Lisa will be meeting Lori at Left Coast Crime, and they’ll definitely raise a toast to all things books and Debs! Natalia Sylvester welcomed a new niece into the world this week!